You're tired of not being able to connect to the WiFi on your iPhone 6 ? If the speed is low, if it always disconnects, or does not connect at all, take action and do not waste your mobile data because of a small issue like that one. Choose this high quality WiFi antenna for iPhone 6, identical to the original one, to fix all your issues. You'll have a stable connection to browse the internet and your apps with a high speed. Just follow our SOSav experts advice with this tutorial which comes with pictures and comments and DIY ! 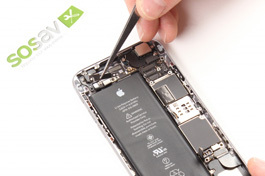 Save up to three times the price than if you went to a professional repairer.